The placenta is a one-of-a-kind organ: made cooperatively by you and baby, the symbol and product of your relationship. For the duration of pregnancy, it works to nourish and support the baby by facilitating transport of nutrients and oxygen, as well as producing progesterone, the hormone that tells your body to stay pregnant. 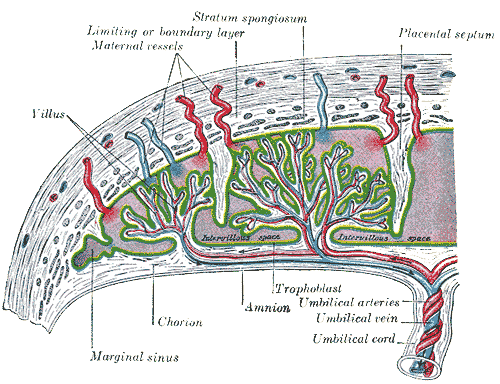 After the birth, this primary purpose is complete, but the placenta is still useful. As evidenced by Traditional Chinese Medicine as well as modern pharmaceutical & beauty product companies, the placenta contains components that are beneficial to the human body. And who better to benefit from this powerhouse organ than the parent and baby who worked together to grow it? There's a sweet completeness to taking the placenta and returning it to your body, where it will help you recover from pregnancy and birth, and if you are nursing, it will continue to feed the baby as well! Improved mood with reduced incidence of postpartum mood disorders; this is sometimes described as mellowing out the highs and lows, or resuming the ability to cope with emotions. Raised iron levels, preventing or alleviating anemia. This is important for anyone who just had a baby, but especially for those who bled a lot and folks who tend toward anemia. Placenta Encapsulation: The placenta is rinsed, steamed, dehydrated, powdered, and put into capsules. This form is best for use during the weeks following birth, for evening out hormones, improving mood, and facilitating recovery. Placenta Tincture: The medicinal qualities of the placenta are extracted into alcohol for long-term preservation. Some people like having a placenta tincture for use months and years after the birth, with menstrual difficulties or menopause. Placenta Smoothie Cubes: These are bite-sized chunks of raw placenta, sometimes frozen for use during the first few days after the birth, to improve energy and promote recovery after a traumatic birth or large blood loss. Some people are clearly drawn to one method of placenta preparation, or a particular form of medicine. For those who are undecided, my recommendations are based on the time period during which each form is best taken. Smoothie cubes are usually used immediately after the birth and in the first few days, especially if there was a large amount of blood loss. Cubes are prepared raw, which is perfectly indicated for this intense, short-term blood building. Each dose uses more placenta per dose than capsules or tinctures, so someone who only chooses cubes will run out sooner than someone who chooses to encapsulate. Placenta capsules are usually taken within the first 6 months postpartum; the tonifying, nourishing qualities of placenta prepared via steaming are best suited to this long-term use, when the goal is to reduce postpartum depression, improve milk supply, or replenish the body after birth. Placenta tinctures are well-preserved, and are therefore great for later use, such as menstrual difficulties or menopausal symptoms. Because it will generally not be used until after the postpartum period has passed, there is no longer a focus on warming yang energy. These are my current thoughts on the different methods of preparing placenta medicine, though they are subject to change should new information present itself. If you have any questions or if you are a care provider with differing opinions, please feel free to contact me. I provide pick-up services from your birthing location (home, birth center, or hospital) & deliver your finished placenta medicine to your home in the Portland Metro area out into the gorge and down to Salem, and in SW Washington north of Vancouver up to Longview. I've even worked with clients in McMinnville. I would also be happy to arrange meeting partway for clients who live farther out. Placenta Encapsulation only: $200. I will prepare your placenta into capsules ready for use within 3 days. I generally include the dried umbilical cord as a keepsake unless clients request it be omitted. Placenta Package: $225. Encapsulation after a small portion of the raw placenta is set aside and tinctured. I also offer $50 off placenta encapsulation for either Pelvic Floor Doula or Labor Massage Doula clients, as well as folks choosing my Integrative Postpartum Bodywork & Support Package. Placenta Prints! Due to requests, I am now offering placenta prints. This is a pretty easy and quick process for me (and cool! ), so I'm happy to do it for an extra $10. I usually get 2 or 3 prints from a placenta, and it doesn't affect the encapsulation process at all. If you have experienced a high volume of blood loss, are particularly susceptible to depression, or for any other reason you are interested, I can reserve a few days' worth of placenta in frozen cubes, for use in smoothies. If you have your baby at home, and are open to using your own ice cube tray, I can do this when I pick up the placenta, so it won't cost you anything extra! For clients birthing in the hospital or a birth center, I have to make an extra trip to bring the cubes to you ASAP, so add $25 for my time and gas money. For a rush turnaround, add $50. When necessary, I can usually get your package completed and ready for you by around 24-36 hours postpartum. Deposit: To ensure quality service and timely turnaround, I limit the number of clients I accept each month. To reserve my time slot, I require a partial payment of $100; the remainder is due when I arrive to pick up your placenta. In the event I am unable to encapsulate your placenta, due to difficult hospital release, health concerns, or if you fail to contact me, I will keep the $100 time slot reservation fee; the remainder will be refunded if it has been prepaid. While handling and preparing your placenta, your health is my first priority. After all, promoting your health is the reason you've chosen to make your placenta into medicine in the first place! To better ensure your safety, I have taken an OSHA-compliant certification course in Bloodborne Pathogens & Infection Control written specifically for Doulas and Placenta Encapsulators. I always wear single-use gloves throughout the entire process (changed at appropriate times), and every item and surface that comes into contact with your placenta is sterilized before and after each use. In addition, I limit myself to preparing one placenta at a time, and of course your placenta is always properly identified. Though based on a combination of centuries-old cultural knowledge and multiple research studies, the statements and information found on this website have not been evaluated by the Food and Drug Administration. Placenta encapsulation is defined as the service of preparing a client's own placenta for consumption or medicinal use, NOT the sale of placentas or placenta products. I am required to say that none of these placenta services are approved to diagnose, treat, cure, or prevent any disease, because (according to the FDA) "only a drug can legally make such a claim." I personally think that's rather problematic, but there we have it. Use of placenta encapsulation or other services assumes prior discussion with your health care provider; clients are responsible for researching and using these services appropriately.